Palm oil mill effluent (POME) is a type of wastewater posing large problems when discharged in the environment. Yet, due to its high nutrient content, POME may offer opportunities for algal growth and subsequent harvesting of high-value products. The marine diatom Phaeodactylum tricornutum is a potential feedstock diatom for bioactive compounds such as the carotenoid fucoxanthin, which has been shown to have pharmaceutical applications. The aim of this paper was to evaluate the growth and fucoxanthin productivity of P. tricornutum grown on POME, as a function of light intensity, temperature, salinity, and nutrient enrichment. High-saturating irradiance (300 μmol photons m−2 s−1) levels at 25 °C showed highest growth rates but decreased the fucoxanthin productivity of P. tricornutum. Box-Behnken response surface methodology revealed that the optimum fucoxanthin productivity was influenced by temperature, salinity, and the addition of urea. Nutrient enrichment by phosphorus did not enhance cell density and fucoxanthin productivity, while urea addition was found to stimulate both. We conclude that POME wastewater, supplemented with urea, can be considered as the potential medium for P. tricornutum to replace commercial nutrients while producing high amounts of fucoxanthin. The possibility of utilizing wastewater as growth medium for microalgae with the aim to produce value-added products receives increasing attention due to its high economic sustainability (Ravindran et al. 2016; De Francisci et al. 2018). In this respect, the marine diatom Phaeodactylum tricornutum has gained much attention in the last decades. This is due to its ability to grow in large-scale facilities, while producing bioactive compounds such as pigments which might benefit human health (Leu and Boussiba 2014). The carotenoid fucoxanthin contained in diatoms as well as in brown seaweeds and other microalgae such as dinoflagellates and coccolithophorids exhibits anti-cancer, anti-obesity, and anti-diabetic activity (Kim et al. 2012). It has been suggested that the production of value-added products from microalgae on the large scale becomes more economically feasible when artificial growth media are replaced by low-cost nutrients such as those derived from agricultural or domestic wastewater (Pittman et al. 2011). Palm oil mill effluent (POME) is agricultural wastewater generated from palm oil processing that could have the potential to fuel microalgal growth due to the high concentrations of micro and macronutrients (Nur and Hadiyanto 2013). However, to the best of our knowledge, the utilization of POME wastewater for the cultivation of the marine diatom P. tricornutum has not been explored. Key environmental factors such as light intensity, temperature, salinity, and nutrient composition, regulate algal growth in large-scale facilities (Borowitzka 2016; Nur and Buma 2018). 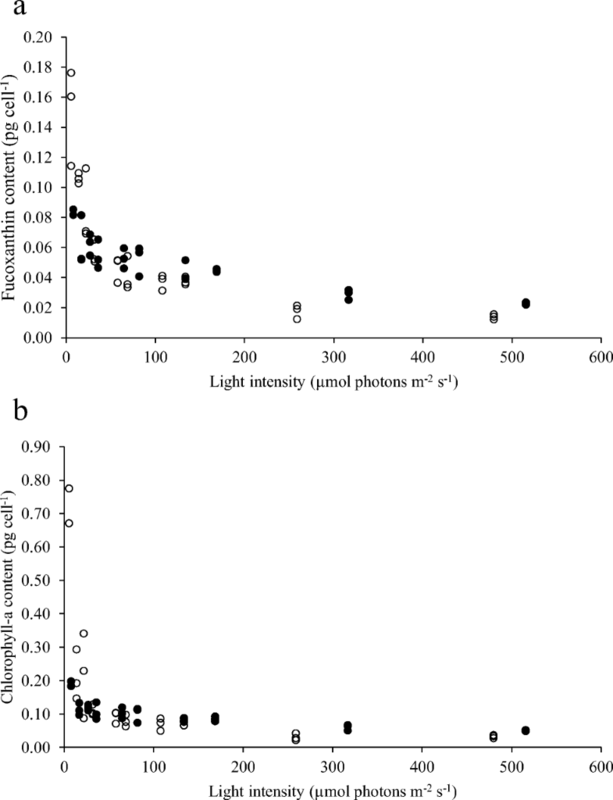 Simultaneously, apart from affecting growth, irradiance level might also affect the fucoxanthin content of P. tricornutum since it is a light harvesting pigment (Gómez-Loredo et al. 2016). Furthermore, supraoptimal temperatures could be an extra stress factor on the growth of P. tricornutum. In addition, the biomass production, growth, and fucoxanthin productivity of P. tricornutum depend on nutrient concentration and the balance between relevant nitrogen and phosphorus (N/P) species in the media (Choi and Lee 2015; Whitton et al. 2016; McClure et al. 2018). The aim of the present paper was to utilize POME as growth medium for P. tricornutum and to find optimal environmental conditions for maximal fucoxanthin productivity by applying different irradiance, temperature and nutrient conditions. To this end, optimal irradiance and temperature dependent fucoxanthin productivity was investigated first based on artificial medium. Then, the impacts of various POME fractions on the growth and fucoxanthin productivity were investigated and selected nutrient additions were done to optimize the fucoxanthin productivity. POME consists of a highly complex mixture of both organic and inorganic N and P species (Poh et al. 2010). As a result, organic and inorganic N/P ratios differ strongly, whereas organic N- and P-containing compounds might be affected by irradiance exposure or bacterial activity. Therefore, both N and P limitation might eventually occur when algae are cultivated on POME alone. Furthermore, different POME pretreatments may lead to N/P ratios above or below the expected optimal Redfield ratio of 16:1. Due to this, the impacts of various nitrogen and phosphorus additions on possible fucoxanthin enhancement were tested. In addition, urea was added since this N source might serve as a cheap alternative to nitrate additions, leading to a nitrogen surplus and thus to complete phosphorus removal from the wastewater. The Box-Behnken design (BBD) response surface methodology (RSM) was employed to reveal the optimum combination of environmental conditions and to understand the interaction of salinity, temperature, and nutrient concentration with respect to fucoxanthin productivity. POME wastewater was collected from a small factory in Sumatra, Indonesia, after it had been released from an aerobic open pond lagoon. The wastewater was stored at − 19 °C to prevent degradation. Prior to the experiments, the wastewater was thawed and filtered through GF/C glass fiber filters (Whatman, 47 mm) to remove particulate matter. Subsequently, the filtrate was sterilized at 120 °C for 15 min. POME composition was analyzed before and after these treatments. Based on these results (Table 1), relevant nutrient additions were chosen: POME treatment (filtration, autoclaving) changed its characteristics in terms of nutrients, pH, and color (Table 1). At the same time, the inorganic N/P ratio of the effluent might theoretically lead to either N or P limitation, depending on the type of treatment (Table 1), given the deviation from the ideal Redfield ratio of 16:1 (Table 1) (Olguin 2012). Furthermore, the potential photochemical or bacterial breakdown of organic N and P species during cultivation might alter these initial molar ratios, thereby creating unforeseen changes in the availability of inorganic nutrients for phytoplankton growth. Therefore, in order to meet cellular nutrient requirements and optimize productivity, some external inorganic nitrogen and phosphorous addition could be necessary. In particular, addition of a cheap nitrogen source such as urea might typically install P limitation at the end of the growth phase, thereby causing almost complete P removal from the wastewater. Stock cultures of P. tricornutum Bohlin (CCMP2558, NCMA, Maine, USA) were grown on a standard f/2 medium based on filtered natural oligotrophic seawater obtained from NIOZ Netherlands (adjusted to a salinity of 35 ppt with demineralized water) using the protocol of Guillard (1975) supplemented with silicate (100 μM) and NaHCO3 (2.38 mM). The culture was acclimated to the experimental conditions for at least 1 week. The algae were cultivated in a 16:8 light/dark cycle. The culture was diluted with fresh medium if growth reached the stationary phase. The research questions were addressed by using a stepwise experimental approach. Four experiments were carried out, as listed below. Cultures of P. tricornutum were grown in triplicate on f/2 medium in plastic 60-mL cell culture flasks (Greiner Bio-One, ref. 690,160). The flasks were placed in a photosynthetron illuminated by a 250 W lamp (MHN-TD power tone, Philips) as described by Kulk et al. (2011) at two temperatures (T = 20 and 25 °C) controlled by a water bath (± 0.1 °C) at 10 different light intensities (I = 8–500 μmol photons m−2 s−1). Samples for cell counts (2 ml) were taken daily and immediately counted using a hemocytometer. Growth rates were calculated from cell counts as described below. The cultures were harvested for pigment analysis at the end of the exponential growth phase (7–14 days). Phaeodactylum tricornutum was cultured in duplicate on an autoclaved mixture of unfiltered POME and sterile natural sea water (no nutrient additions) at different unfiltered POME dilutions (15, 30, and 50% v/v) with a working volume of 75 mL in sterilized 100-mL Erlenmeyer flasks. An inoculum of 2% (v/v) of the culture was used to start the experiments. The flasks were placed in a climatized room equipped with fluorescent lamps (Biolux Osram). The temperature of the room was set at 23 °C, initial pH was adjusted to 8.2 with 2N HCl or 2N NaOH and light intensity was adjusted outside the cultivation medium at 100 μmol photons m−2 s−1, resulting in different light penetrations for each flask. The samples for cell counts (2 ml) were taken daily and immediately counted by using a hemocytometer. Growth rates was calculated from cell counts as described below. At the end of the exponential growth phase (8 days), the cultures were harvested for pigment analysis. Phaeodactylum tricornutum was cultured in 75-mL working volume in 100-mL sterilized Erlenmeyer flasks and placed in a water bath equipped with temperature controller and a U-shaped lamp that contained 12 fluorescent lamps (6 biolux and 6 skywhite lamps, Osram) coupled with reflectors (Doublelux) and connected to dimmers (Osram) and set as described by Van de Poll et al. (2007). About 2% (v/v) of P. tricornutum culture was used to inoculate autoclaved and filtered medium consisting of 30% v/v POME + 70% v/v filtered natural oligotrophic sea water. Cultures growing on 30% POME alone (no nutrient additions) served as controls. Nitrogen and phosphorus were added to the media to generate different N/P molar ratios (Table 2). All media were supplemented with silicate (100 μM). The experiments were carried out at 20 and 25 °C, initial pH was adjusted to 8.0 ± 0.2 by using 2N HCl or 2N NaOH, and salinity was adjusted to 35 ppt using NaCl. The light intensity was measured using a light sensor (Biospherical Instrument QSL2101, USA) and set to 300 μmol photons m−2 s−1 inside the cultivation medium and, if necessary, adjusted by using neutral density screens. The samples for cell counts (2 mL) were taken daily and immediately counted using a hemocytometer. At the end of the exponential growth phase (7–15 days cultivation), the cultures were harvested for pigment analysis. where y is the predicted value; β0, βi, βii, and βij are a constant, linear, quadratic, and interaction coefficient, respectively. Cultivation was carried out in the same setup as the third experimental series. Salinity was adjusted by using a mixture of Milli-Q and natural sea water, light intensity was set inside the media at 300 μmol photons m−2 s−1, and the initial pH was adjusted to 8.0 ± 0.2 by using 2 N HCl or 2 N NaOH. The medium was supplemented with 100-μΜ silicate. After 7 days of cultivation, the cultures were harvested to measure the cell density and pigments. Chemical oxygen demand (COD), total nitrogen (TN), and total phosphorus (TP), were analyzed by using the assay kit LCK514, LCK349, and LCK138, respectively, provided by Hach Lange on a 3900 DR spectrophotometer, following the protocol listed in the assay product kits. Wastewater sample was collected from different sources, raw POME, autoclaved, and autoclaved + filtered (GF/C). The sample was hydrolyzed according to the protocol to measure TN and TP. where μ is the growth rate (day−1), X2 is the cell density (cells mL−1) at time t2 (day), and X1 is the cell density (cells mL−1) at time t1 (day). Between 5 and 25 mL of sample was filtered through a GF/F filter (25 mm, max pressure − 0.2 bar). The filter obtained was folded in aluminum foil and immersed immediately in liquid nitrogen, and then stored at − 80 °C until analysis. Before analysis, the filters were freeze-dried at − 50 °C for 48 h and a pressure of 30 × 10−3 mbar. Extraction was conducted by adding 5 mL of 90% cold acetone into the sample at 4 °C for 48 h. After extraction, the sample was analyzed using HPLC using a Waters (Model 2695) system, a cooled auto-sampler (4 °C), and a Waters 996 diode-array detector. The freeze-drying, extraction, and HPLC analysis methods are based on van Leeuwe et al. (2006). The volumetric fucoxanthin or chlorophyll-a productivity was calculated based on Eq. 3.
where Pp is pigment productivity (μg L−1 day−1), Nh is final cell density (cells L−1), N0 is initial cell density (cells L−1), Cp is pigment content (μg cell−1), and t is total duration of the cultivation (days). IBM SPSS Statistics 24 was used for all statistical analyses. Minitab ver. 18. (Demo version) was used for BBD design and evaluation. Difference between treatments were analyzed with analysis of variance (ANOVA) with a p value of 0.05. Post hoc tests (Tukey HSD) were performed for pairwise comparisons. The experimental results were obtained for a minimum of two replicates and expressed using averages and standard deviations (±SD), except for wastewater characteristic analysis. The growth rate of P. tricornutum growing on f/2 medium without POME (first experimental series) varied significantly with temperature and irradiance (Fig. 1). Three types of light responses were distinguished: low light (LL, < 100 μmol photons m−2 s−1); medium light (ML, 100–200 μmol photons m−2 s−1); and high light (HL, > 200 μmol photons m−2 s−1). At ML and HL, the growth rate was influenced by temperature (p < 0.01). At 25 °C, the growth rate was significantly (p < 0.01) increased as compared with the 20 °C cultures. Light was found to be saturating at 100 μmol photons m−2 s−1 for 20 °C with the maximum growth rate of 0.95 day−1. At 25 °C, growth was saturated at 175 μmol photons m−2 s−1 with a maximum growth rate of 1.41 day−1. 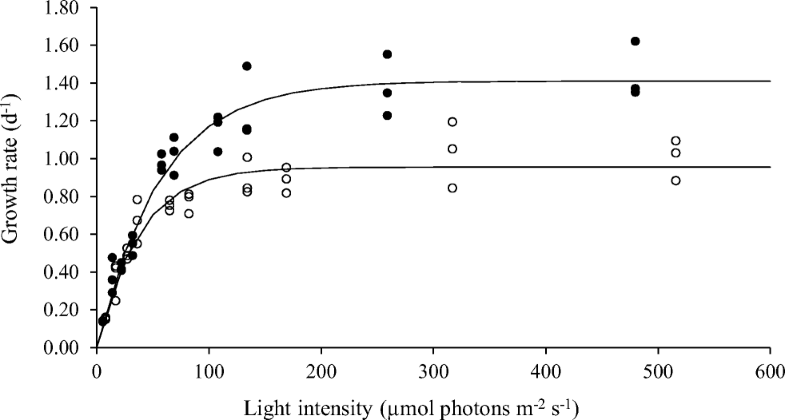 For both temperatures, no photoinhibition was found up to 500 μmol photons m−2 s−1 (Fig. 1). Fucoxanthin and chlorophyll-a content were both irradiance and temperature-dependent (Fig. 2). Fucoxanthin content was significantly lower at ML and HL compared to LL for each temperature (p < 0.01). However, when comparing both temperatures, the fucoxanthin content significantly differed only at ML and HL (p < 0.05). For fucoxanthin and chlorophyll-a productivity (Fig. 3), the highest value was found at around 100–125 μmol photons m−2 s−1 for both temperatures. The pigment productivity was not significantly different when comparing both temperatures (p > 0.05). When cultivating P. tricornutum on different sterilized-unfiltered POME concentrations (Fig. 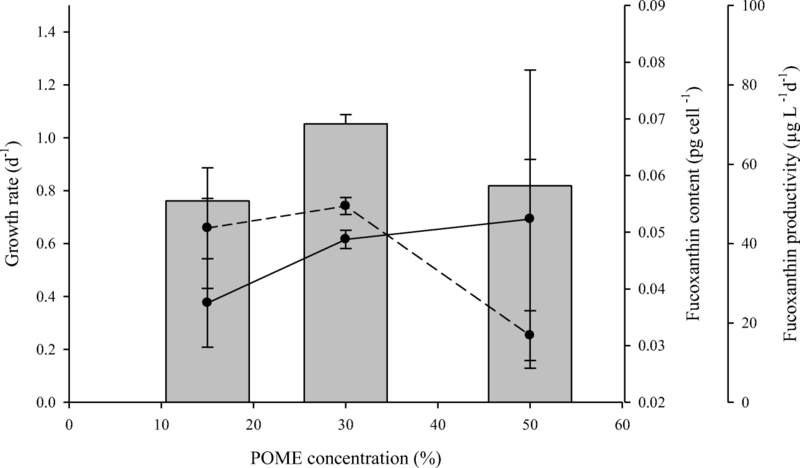 4) increasing POME concentrations slightly promoted the cellular fucoxanthin content, from 0.04 ± 0.01 for the 15% to 0.05 ± 0.03 pg cell−1 for the 50% POME culture but these results were not significant. An optimum growth rate was recorded at 30% v/v, followed by 50% v/v, and 15% v/v of POME (Fig. 4). However, the growth rate at 50% v/v POME did not significantly differ from the 30 and 15% v/v POME conditions. In addition, the fucoxanthin productivity was significantly higher at 30% v/v POME compared to 50% v/v POME (p < 0.05) Given this result, 30% POME was used for all subsequent experiments. The addition of external nitrogen and/or phosphorus resulted in different N/P molar ratios in the media as well as final cell densities and fucoxanthin productivity (Table 2). At 20 and 25 °C, the highest cell density was found when P. tricornutum was grown on f/2 medium, followed by POME, low nitrate, high phosphate, and trace elements (NPT); POME, low urea and high phosphate (UP); and POME, low nitrate and high phosphate (NP). Lowest final cell densities were found in the cultures grown on POME supplemented with phosphorus (P-High, P-Low) followed by control medium (30% POME, no nutrient addition). The addition of nitrogen in the form of urea (U) resulted in significantly higher final cell densities compared to the control medium (30% POME, no nutrient addition) and phosphorus additions (P-High, P-Low). The addition of trace elements (NPT) did not significantly influence the cell density compared to NP and UP (p > 0.05). With respect to fucoxanthin, the highest productivity was found in the f/2 medium, followed by NPT medium (p < 0.05). The addition of both nitrogen and phosphorus to the 30% POME medium enhanced fucoxanthin productivity compared to the control (30% POME, no nutrient addition) (p < 0.05). Furthermore, the addition of urea alone increased fucoxanthin productivity 6.3-fold compared to the control, while the addition of phosphorus alone (P-Low and P-High) was not significantly different from the control (p > 0.05). The addition of urea only (U) resulted in a high fucoxanthin productivity, similar to NP and UP cultures which had access to external phosphorus as well as external nitrogen (p > 0.05) (Table 2). 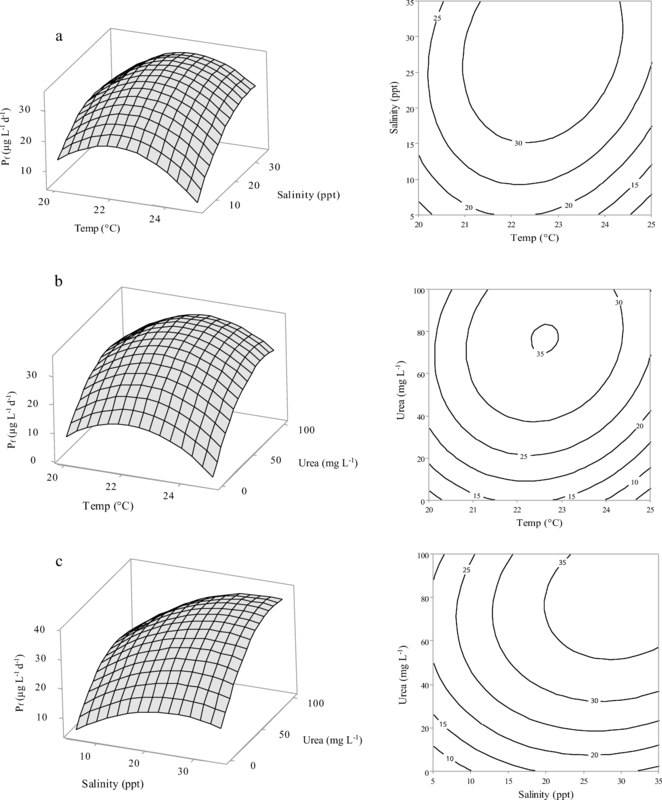 Optimization of fucoxanthin productivity as a function of salinity, temperature, and urea addition. where X1, X2, and X3 are temperature (°C), salinity (ppt), and urea (mg L−1), respectively. ANOVA was employed to test the significance of the fit of the proposed model. A p value < 0.05 was used to demonstrate the significance of the factors and the interactions. A linear effect indicates that fucoxanthin productivity was positively correlated with the tested condition. On the other hand, a quadratic effect indicates that the factor interacts itself and has an optimum value inside the tested range. As shown (Fig. 5), temperature, urea, and salinity were important factors to obtain the optimal fucoxanthin productivity. Furthermore, all tested two-way interactive effects between the factors were not significant (p > 0.05). The optimum condition for fucoxanthin productivity was at a urea addition ranging between 80 and 85 mg L−1, a salinity between 25 and 31 ppt, and a temperature between 21 and 23 °C. As for final cell density, urea and temperature were found to be the factors mostly influencing cell density, while salinity only slightly influenced cell density (p = 0.057). For final cell density, it was also shown that a urea level exceeding 60–100 mg L−1 and a salinity exceeding 20–30 ppt resulted in lower cell densities. Finally, the optimum temperature in terms of cell density was estimated at 21.5–22 °C (Fig. 6). Overall, the optimum combination of environmental conditions with respect to cell density (8.13 × 106 cells mL−1) was found to be 21 °C, 23 ppt salinity, and 90 mg L−1 urea addition. When focusing on pigments as value-added products at large-scale cultivation, it is vital to study the effects of light intensity on pigment productivity. In diatoms, including P. tricornutum, chlorophyll-a and fucoxanthin are the major light harvesting pigments (Gómez-Loredo et al. 2016). As a result, cellular contents of both pigments showed a classical strong irradiance relationship when considering cellular content (Fig. 2). 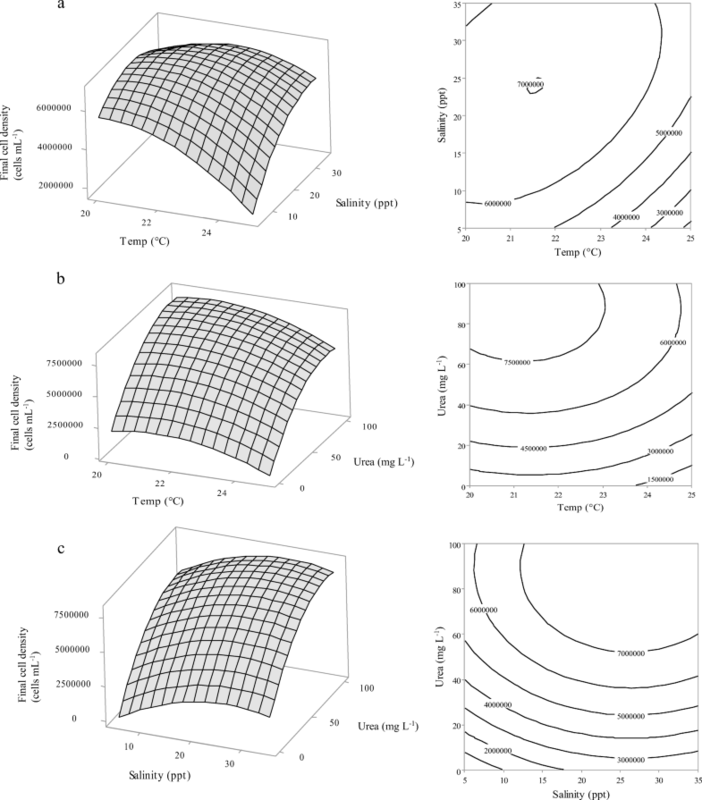 This implies that supraoptimal irradiance levels in large-scale cultivation setups would not benefit fucoxanthin productivity, even when growth rates are high (Fig. 1). However, by adjusting the cell density, the average irradiance received by the cells can be adjusted (Richmond 2013). 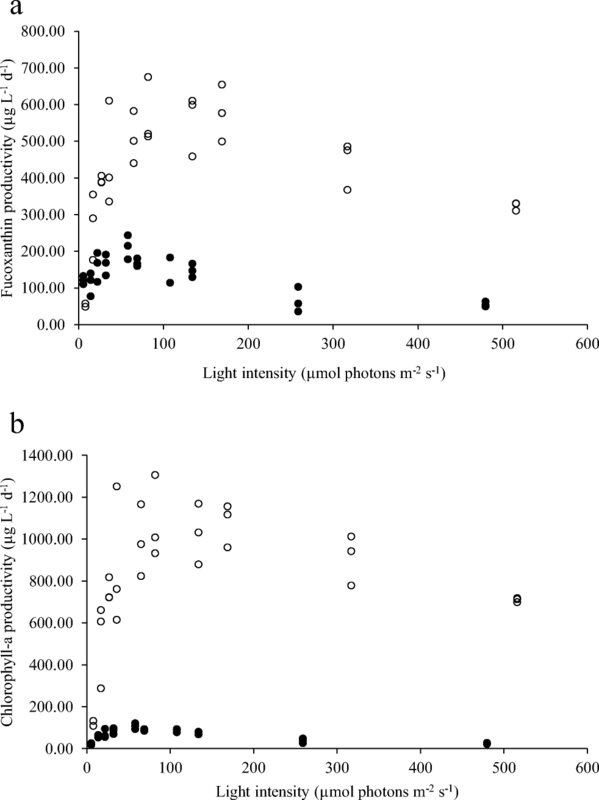 The optimum light intensity for pigment productivity was at around 80–125 μmol photons m−2 s−1 (Fig. 3). In addition, temperature influenced the pigment content and productivity only at the high light intensities (HL). Therefore, the productivity of fucoxanthin of P. tricornutum in a bioreactor and outdoor cultivation could be optimized by controlling the light intensity at a relatively low level or adjusting the cell density. Previous studies showed that in order to reduce contaminants and turbidity, a pretreatment process of wastewater is important for microalgal growth. Wang et al. (2015) found that centrifugation of digested poultry manure effluent gave higher biomass of Chlorella vulgaris compared to autoclaving (120 °C, 30 min). Cho et al. (2011) found that filtration (0.2 μm) was more efficient compared to UV-B irradiation to treat secondary municipal wastewater as growth medium for Chlorella sp. with the aim to produce lipids. Shah et al. (2016) reported that different dilutions of raw POME wastewater mixed with sea water influenced the dry weight of Tetraselmis suecica and Nannochloropsis oculata due to the changes in nutrient composition and light penetration in the medium. However, at high treated POME concentrations, the high organic substrate together with high turbidity inhibited the growth rate of microalgae (Nur et al. 2017). In our experiments, growth rate was higher at 30% POME (v/v) than at 15% POME (v/v) which might be due to enhanced nutrient concentrations in the 30% POME cultures. On the other hand, when 50% v/v POME was used, the growth rate was lower, likely related with enhanced turbidity in the bottles, lowering light availability and thus increasing the fucoxanthin content as found in the first experimental series (Fig. 2). This finding was supported by Hadiyanto et al. (2017) who reported that the optimum growth rate and biomass production for the marine alga Nannochloropsis sp. was found on 30% digested and filtered POME. On the other hand, the cellular fucoxanthin content at the 50% POME condition was only slightly enhanced and did not significantly differ from the lower POME concentrations. This indicates that other factors might explain the observed lower growth rates in the 50% POME cultures. High ammonia concentrations in the wastewater are considered inhibitory for P. tricornutum (Ayre et al. 2017). Furthermore, the presence of potentially toxic phenolic compounds in digested POME could also lower the growth rate of P. tricornutum (Limkhuansuwan and Chaiprasert 2010; Duan et al. 2017). Overall, a 30% POME fraction was found to be the most suitable medium to optimize fucoxanthin productivity in P. tricornutum. In our experiments, P. tricornutum was found to grow on 30% POME alone (control, no nutrient addition) at both temperatures. The N/P inorganic nutrient ratio (13:1) contained in this POME medium was close to the Redfield ratio (16:1). Yet, the addition of nitrogen species (nitrate, urea) strongly increased growth rate and fucoxanthin productivity. Apart from enhancing growth rate and pigment productivity, the addition of external inorganic nitrogen beyond the Redfield ratio would guarantee efficient phosphorous removal from the wastewater. The result was also supported by Halim et al. (2016) who reported that the addition of inorganic sodium nitrate and dihydrogen phosphate into digested POME increased the biomass production of Nannochloropsis sp. and C. vulgaris, compared to the control POME medium. However, in our finding, the addition of urea was found to be a good alternative to nitrate addition. Our experiments show that the addition of sole urea enhanced the fucoxanthin productivity and cell density as compared with cultivation on 30% (v/v) POME alone. At the same time, addition of phosphate alone did not result in a significantly higher fucoxanthin productivity and final cell densities. This implies that the availability of phosphorous in 30% v/v POME does not limit the growth of P. tricornutum under our experimental conditions. 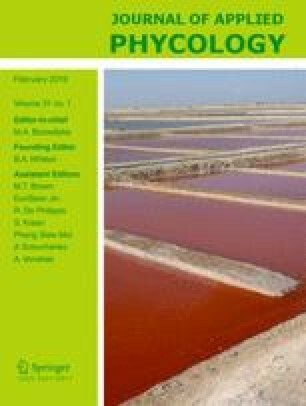 This finding was supported by a previous study who reported that a high amount of external nitrate increased the fucoxanthin productivity, growth rate, and biomass production of P. tricornutum and Odontella aurita cultivated on a modified f/2 and a modified L1 medium, respectively (Xia et al. 2013; McClure et al. 2018). Furthermore, early nitrogen limitation reduced the fucoxanthin productivity of P. tricornutum cultivated on a modified f/2 medium (Alipanah et al. 2015). The present study shows that the replacement of nitrate with urea did not give a significantly different fucoxanthin productivity. This is in accordance with a previous study showing that urea is a suitable nitrogen source for P. tricornutum growth and cell productivity (Guzmán-Murillo et al. 2007). The strategy of adding only urea instead of other nitrogen sources (e.g., nitrate) or phosphorus could therefore significantly save production costs as it is a readily available and cheap nutrient source. However, the addition of urea needs to be more explored and optimized due to the potential toxic effects of high ammonium or ammonia concentrations derived from urea conversion (Tuantet et al. 2014; Agwa and Abu 2016). To apply cultivation at a large scale, the environmental factors that are associated with the production cost should be taken into account. Salinity, temperature, and urea addition were therefore evaluated with respect to the optimal fucoxanthin productivity. In this final experimental series, increasing urea and salinity were found to have a positive effect on the fucoxanthin productivity. The optimum temperature when considering fucoxanthin productivity was found at around 21–22 °C. Previous studies showed that the optimum temperature for biomass production of P. tricornutum was 21.5 °C, at a salinity range between 20 and 30 psu (Yongmanitchai and Ward 1991; Liang et al. 2014), which is in agreement with our results. Furthermore, the optimal urea addition was found at around 80–85 mg L−1. Possibly, high urea concentrations might lead to growth reduction through toxicity effects. Previous researchers demonstrated that microalgae can assimilate urea as a source of nitrogen by converting it to NH4+ and CO2 through urease activity or ammonium and bicarbonate via ATP-urea amidolyase (Bekheet and Syrett 1977; Solomon and Glibert 2008). This might lead to high ammonium or ammonia concentrations, which tend to be toxic for diatoms such as P. tricornutum, as well as other algae such as chlorophytes (Fidalgo et al. 1995; Collos and Harrison 2014). Setyoningrum and Nur (2015) also found that optimum urea addition for the production of C-phycocyanin by Spirulina platensis was 115 mg L−1. Moreover, our study showed that the interactive effect between variables was not significantly influencing the fucoxanthin productivity. It revealed that the combined factors did not influence each other significantly during cultivation (Fig. 5, Table 3). Thus, the strategy by maintaining the factors at optimum conditions could enhance the fucoxanthin productivity. The present study has shown that P. tricornutum may be used for large-scale cultivation on 30% v/v POME with the aim to produce a value-added compound such as fucoxanthin. However, some issues need to be addressed with care. These include optimal irradiance levels, which are likely much lower than outdoor incident solar irradiance levels, especially in the (sub)tropics. Furthermore, optimal temperature and salinity conditions need to be addressed as shown in our final experimental series. It is considered that 30% of filtered POME is the potential medium for P. tricornutum to replace commercial nutrients and produce high amounts of fucoxanthin productivity. However, the addition of urea greatly enhances the biomass and fucoxanthin productivity while at the same time ensuring the removal of phosphorous from the wastewater. E-supplementary data of this work can be found in online version of the paper. This project was funded by Lembaga Pengelola Dana Pendidikan (LPDP), Kementerian Keuangan, Republik Indonesia. Reference no. PRJ-72/LPDP.3/2016.